Michigan had the lead halfway after Siobhan Haughey‘s split on the 2nd leg, but Cal’s Amy Bilquistclosed the gap by half a second on the 3rd leg. It came down to Daria Pyshnenko (47.68) vs. Abbey Weitzeil on the anchor leg. Cal’s Weitzeil, still swimming with her arm wrapped up, dominated the anchor leg. She flipped in 21.43 en route to a 46.07 split, touching for Cal’s new NCAA Record of 3:06.96. Because Cal’s aquatic complex on the Berkeley campus is so compact the swimmers are very near the fans at the meet. I got to know Amy Bilquist’s grandmother at the meets. Same with Men’s team members. 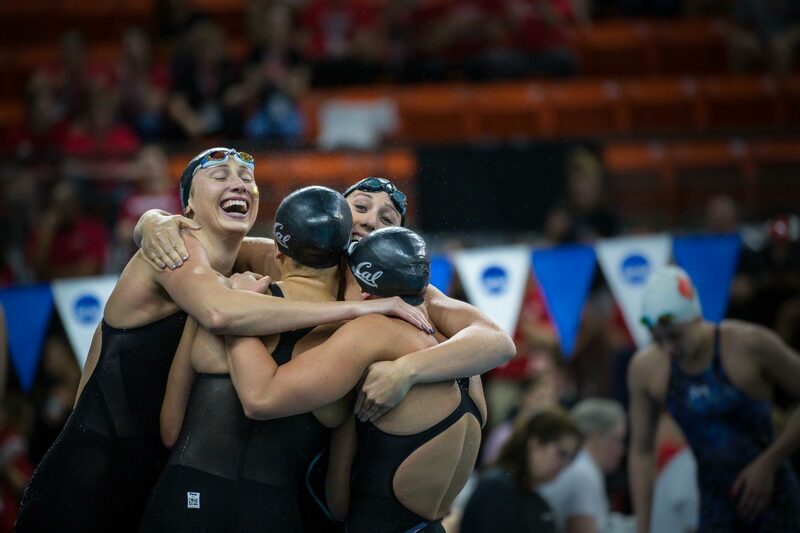 We will miss this Senior class with Bilquist, Katie McLaughlin, Kathleen Baker (wish she would have stayed one more season) and the rest of the seniors. Quite a class! Teri did a magnificent job at the NCAAs. She will have to pull a “rabbit out of the hat” to equal this year’s performance! Ivy and Weitzeil will only be able to do so much in leading the team next season.